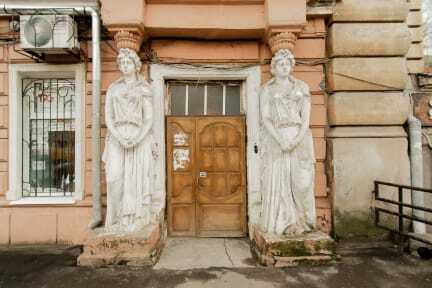 In the hallway there is marble staircase, the entrance is decorated with beautiful female figures , ceiling height is 420 cm. Interior design mainly made of natural wood. Hostel located right in the centre of the city in walking distance of main parts. There are supermarket, ATM, bike rental and restaurant in 3 minutes walking distance. You can go to the beautiful beach by shuttle bus and reach it in 15 minutes. 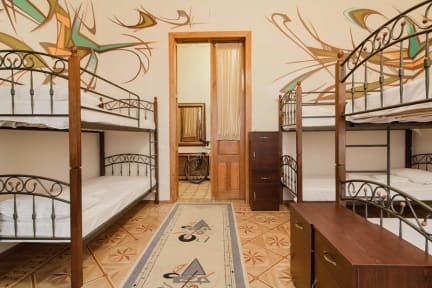 Hostel has one private room for two, one mixed dorm for four, and two dorms by 8, one of them is female dorm.Each room has air conditioner, every day cleaning is provided. Rooms are very tall more than 4meters, it is beautiful and old building. There is small cabinet next to every bed. Female dorm has balcony. Mama Hostel Polcies and Conditions.